← Is a Hands-on Sewing Class Worth It? 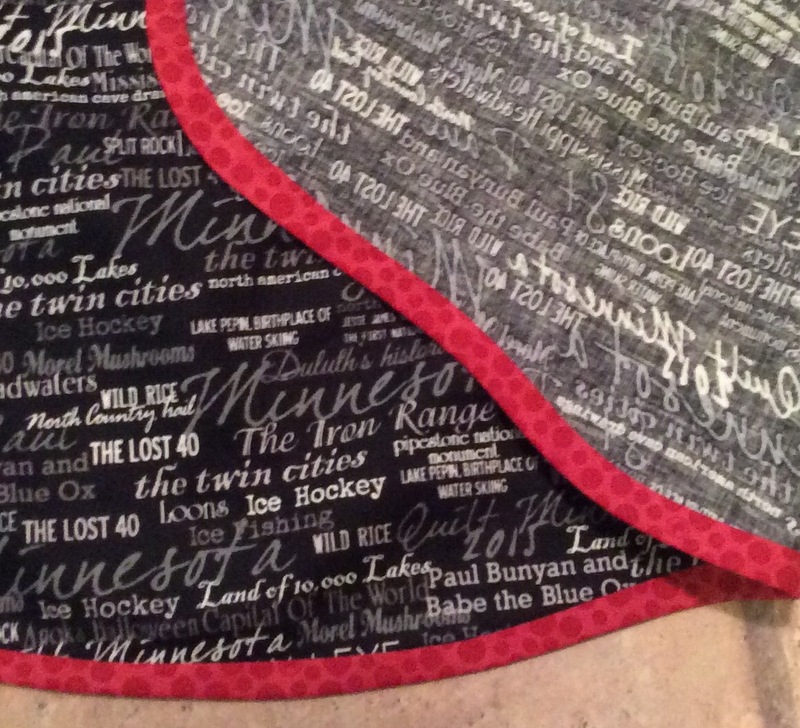 Wasn’t planning on sewing Christmas gifts–other than PJs for The Grands–until I spied some Minnesota word print fabric at a Christmas boutique. A stop at the local quilt shop and I walked out with several Minnesota themed fabrics to mix and match for an apron gift. Knew it would have to be a ‘quick to make’ project and fabric glue is at the top of the list for quickies. I grew up in the days when everyone wore an apron in the kitchen–their kitchen, friends kitchens, family kitchens, church kitchens, and had a drawer full of them. Christmas and birthdays were sure to garner a new collection. Grandma Walk left a dresser drawer of unworn aprons, “Too good to wear.” Both Mom and Grandma had ‘favorites’ with a shredded line across the tummy from rubbing against the edge of the kitchen sink. 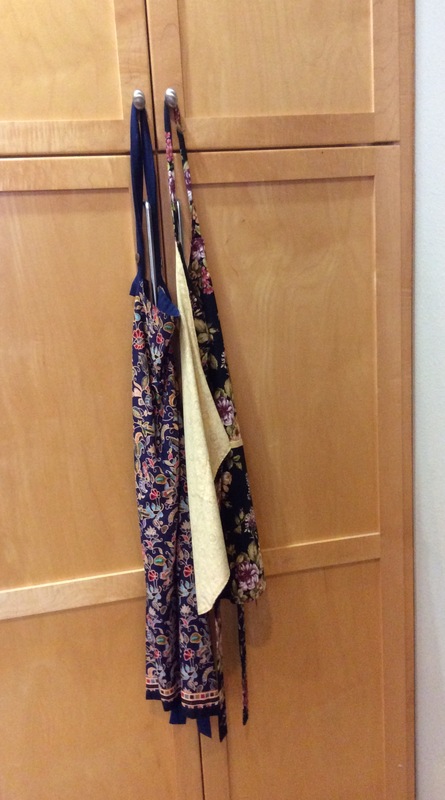 I never took to aprons as I wore jeans and sweatshirts; Mom and Grandma wore House Dresses. Jeans and sweatshirts didn’t require ironing after laundering as did the dresses, so why bother protecting them, just one more thing in the laundry. Neither did my contemporaries and am happy to say, nary a one appeared at my bridal showers. 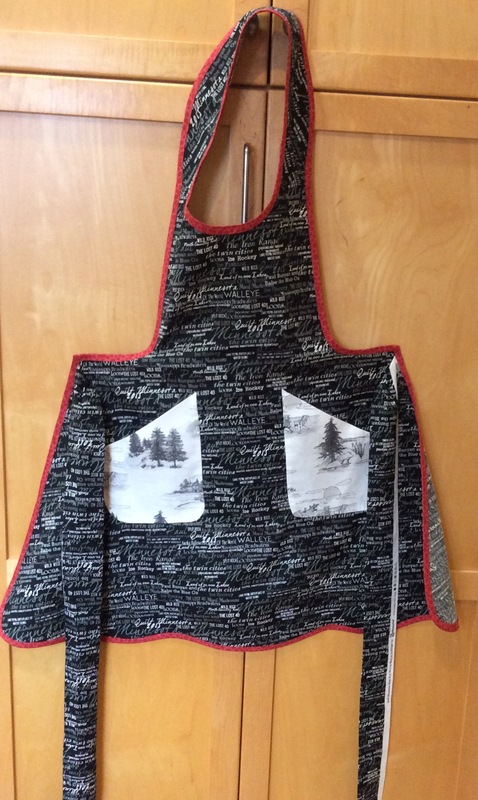 In the last few years, aprons have made a comeback and I have succumbed to making them as gifts, and even received a couple. They hang on a kitchen cupboard door as textile embellishment rather than worn. What can I say, another item in the laundry and would probably need ironing. Nor have I seen the gifted aprons worn; my Sister’s have theirs hanging on cupboard knobs too. 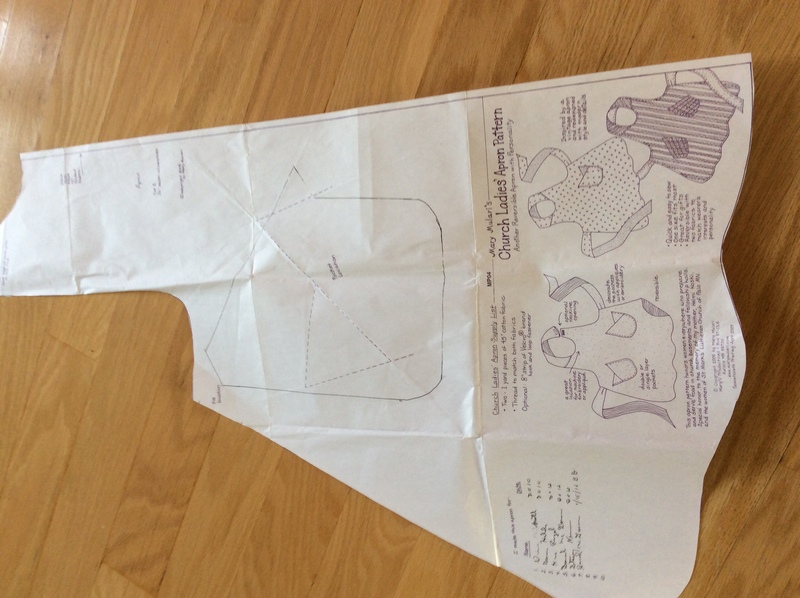 Bias binding and aprons go together like bread and butter. The first ones I made were totally machine sewn. However, the finished product has been my nemesis as the wrong side never looks as good as the right side. Contrary to millions of Pinterest postings, unless using a binding foot, the wrong side will never, never, never, look as good as the right side. Qualifier: If you practice, practice, practice and apply bindings on a daily basis, maybe, just maybe, the wrong side will be perfection. Several years ago, I began experimenting with fabric glue when I made a couple of baby swaddle blankets for Etsy. If the product is for public consumption, it has to be Perfect. 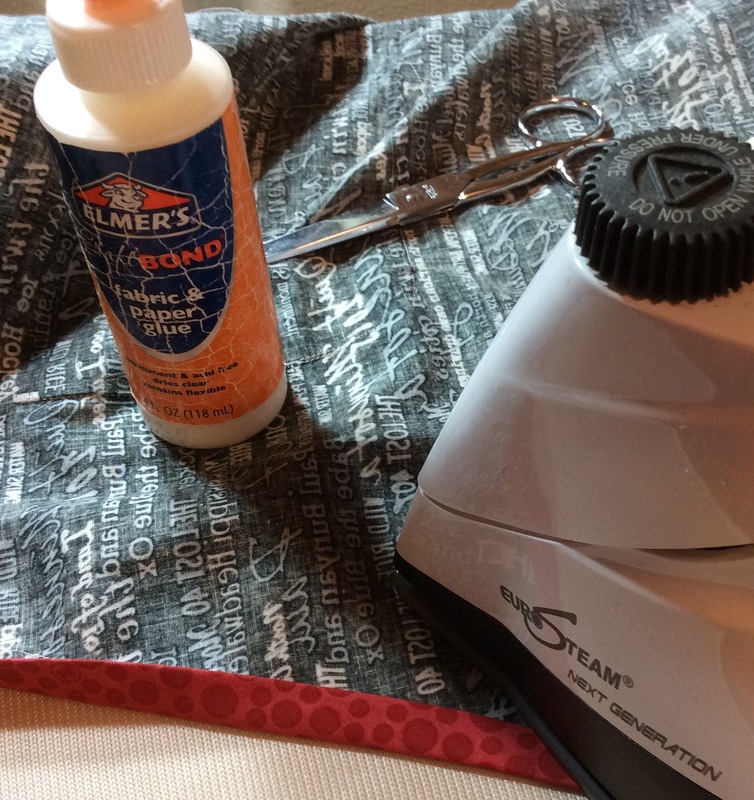 I found that fabric glues were vastly improved and have used them ever since. They dry clear, are acid-free, flexible, washable and permanent. Read the label and sample; sample each time a new/different fabric is used. 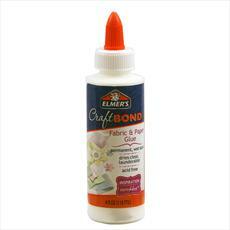 Currently, my fave is Elmer’s Craft Bond, Fabric and Paper Glue. And, best of all, it doesn’t harden in the bottle. With a gazillion years of experience under their belt, Elmer’s has perfected the dispenser tip so it doesn’t clog–if Grands remember to close it! Dispenser tip lays down dots and/or fine line of glue. Finger press binding in place. Keep a damp towel handy to wipe off any excess. Once glue dries, it’s permanent. Let dry at least 24 hours before washing. Isn’t it gorgeous! Both binding sides are equal width and no stitching that meanders where ever from folded edge. 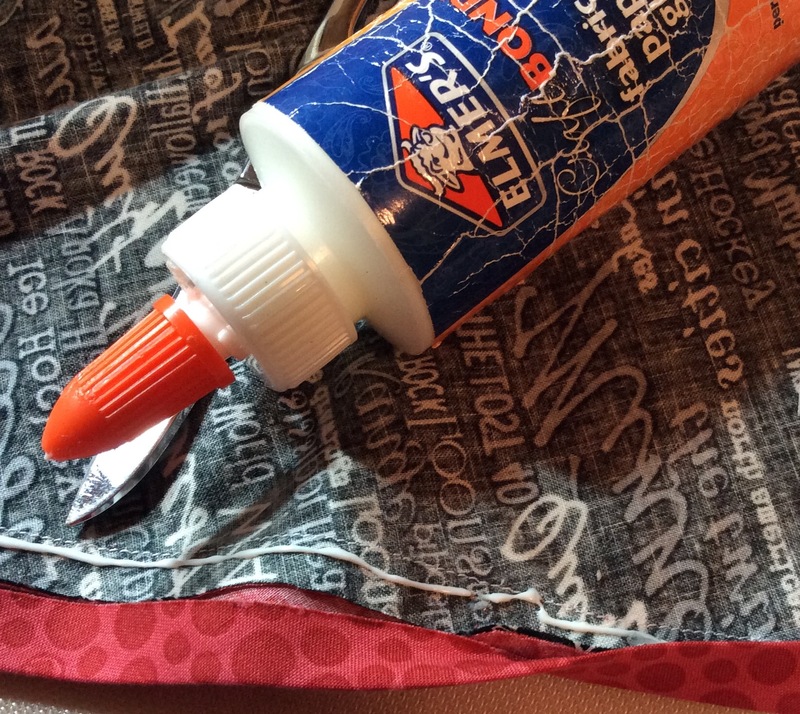 Fabric Glue Tips–Try It; You’ll Like It! Start with accurate sized binding. 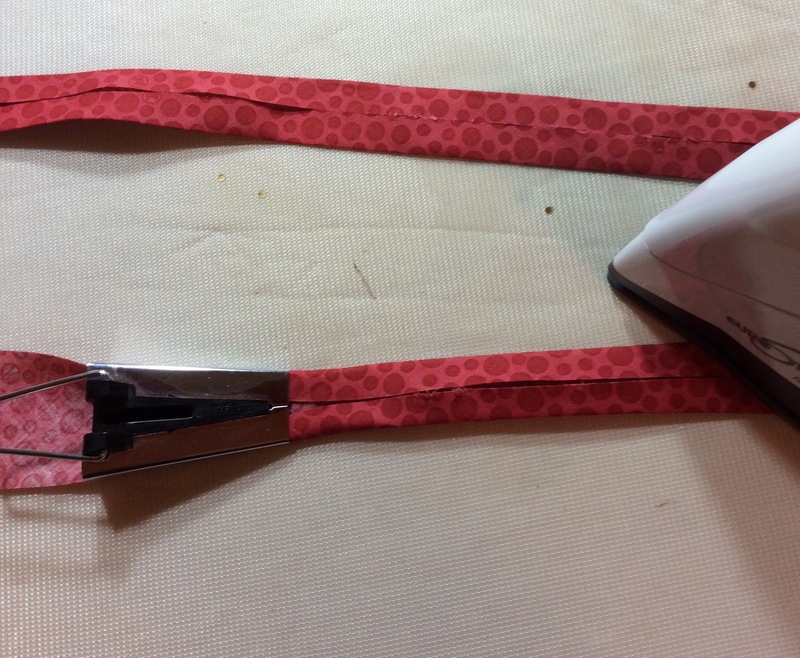 Test glue on each fabric; it should remain flexible and not show through to the right side. 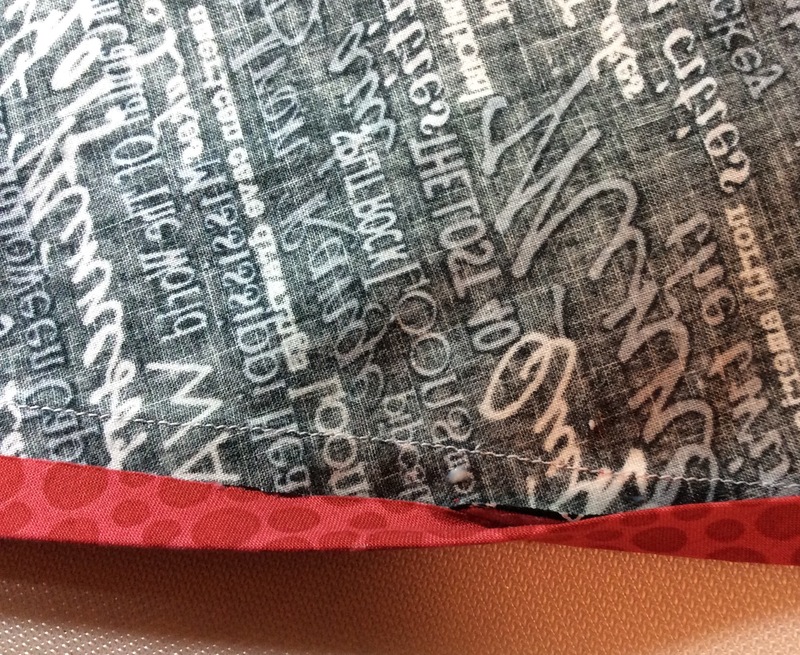 With bindings, there are multiple layers of seam allowances so show-thru shouldn’t be a problem. Keep a damp towel handy when working with glue; wipe it off project or working surface before it dries. Glue will not be any heavier or stiff than thread topstitching. It’s quicker than topstitching, stitching-in-the-ditch, whatever sewing method. An inside view to be proud of! 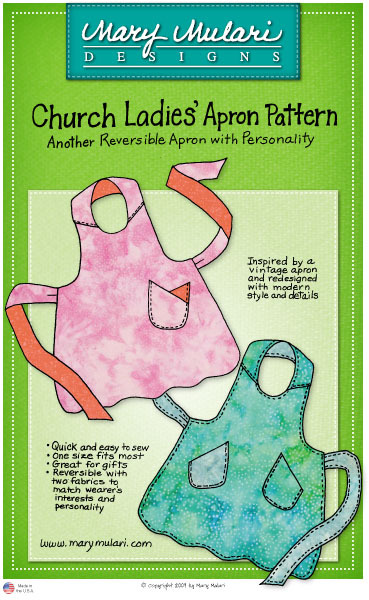 I like Mary Mulari’s Church Ladies Apron Pattern for it’s name and it has pockets (cell phone–if I wore it–although Grandma used it for a handkerchief). It can be made reversible, eliminating the more time-consuming binding. I like binding for the edge contrast, plus am determined to conquer PERFECT bias binding, even though I may only do it once a year. The glue process seems to be a winner so can check this off my sewing bucket list. Mary conveniently includes a log/record of who/when pattern was used. Looks like Sarah is getting a 2nd apron–OOPS! Oh well, the other one was a Christmas print in 2012 and she doesn’t wear that one either. Maybe this one will at least get displayed to show CA friends her Minnesota roots on an apron. Ya Think? I grew up in a country church and the annual Ladies Aid, aka Church Ladies, fundraiser was the Church Supper cooked and served in the basement. Yes, the ladies all wore aprons, one from the top of the dresser drawer. Garrison Keillor, a Midwest author and media personality, has popularized Church Ladies, church suppers, green jello salad… in his NPR monologues and book, Church People. Church Basement Ladies is also a popular Midwest stage production. Another apron blog, this one with top-stitched hem. Mary Mulari’s Church Ladies Apron. This entry was posted in FIBER ARTS and tagged apron, bias binding, Church Ladies, fabric glue. Bookmark the permalink.